Flung into a world of revolutionary conviction and maddening corruption, horrifying violence and passionate devotion, the title character of Tosca finds herself ensnared in a tightening web of tragic events. The opera, taut and melodramatic, unfolds over the course of a single day in Rome, in June of 1800. Throughout, the celebrated diva Floria Tosca is at the center of the action. She flirts with her beloved, the painter Mario Cavaradossi, prays, and sings; then, after crisis strikes, she resists the advances of the villainous Scarpia, kills him, escapes, rushes to save Mario, fails to do so, and, finally, seizes her own destiny from the parapets of the Castel Sant’Angelo. As she endures these trials, Tosca emerges as a deeply complex character. Her complexity flows from many sources: the artistic vision of the opera’s creators, the perspectives of her fellow characters, and the interpretive choices of the singer performing the role. Tosca has rich historical roots. Puccini based his work on La Tosca, an 1887 play by the prolific French dramatist Victorien Sardou. La Tosca, like many of his 70-plus plays, features a sensational plot, meticulous attention to historical detail, and overtly political themes. Puccini and Sardou worked together on the adaptation, meeting several times in Paris to discuss the project. The collaborative process was largely harmonious, but on one vital point, Sardou’s wishes overrode Puccini’s: while Puccini initially envisioned a drawn-out final scene, Sardou insisted upon the abrupt, explosive conclusion that now stands as a hallmark of the opera. Puccini also embraced Sardou’s commitment to historical accuracy as he composed, even climbing to the ramparts of the Castel Sant’Angelo at sunrise so that he could listen to the church bells resounding across the landscape. In Sardou’s play, the character of Tosca is equipped with a substantial backstory. Born to modest circumstances as a goatherd, she spent her teenage years in a convent, where her extraordinary voice was discovered, catalyzing her rise to fame. In contrast, Puccini’s Tosca is more of an unknown quantity. 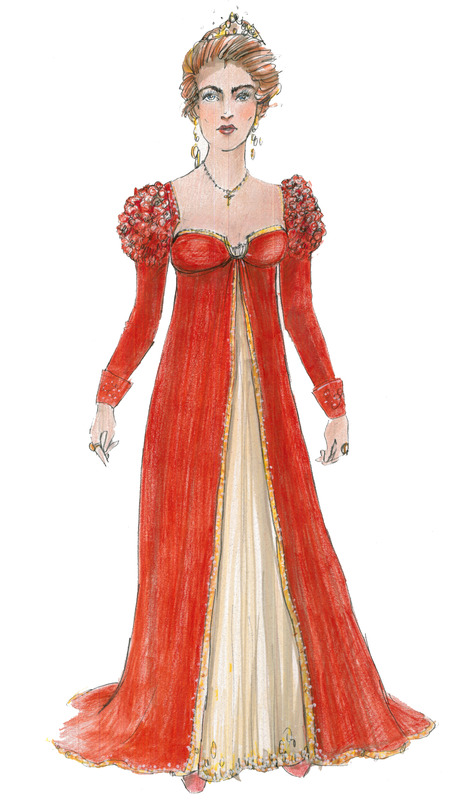 She appears onstage in Act I of the opera in the prime of her life, a gloriously successful singer and a woman in love. Audiences learn nothing of her past, of what she was like before this fateful day. What they do learn is that that she does not fit easily into any single archetype, but rather seems to evoke several. At various moments throughout the opera, she embodies the innocent victim and the jealous lover and the transcendent artist and the angry murderess and the pious believer—all of which converge to make her a multifaceted, potentially ambiguous character. specimen of female beauty and an object of their desire. or a hero in spite of them? Is she strong or vulnerable? What is she capable of? The point is not so much that her actions answer these questions definitively, but rather that her character invites them. The contrast between how men perceive Tosca and how she perceives herself raises more expansive questions about how women are portrayed in opera writ large. Because the art form historically has been dominated by male composers, female operatic characters are typically the products of men’s imaginations. Yet it’s undeniably true that women, as performers, are essential to opera; it relies on their voices, their bodies, the power of their presence. Indeed, it is no exaggeration to say that without women, opera could not exist. So a paradox emerges: while male composers dictate the representation of women in opera, female performers bring their own interpretations and artistic decisions to those characters as they are presented onstage. Tosca brings these issues to the fore in especially dramatic fashion. After all, Floria Tosca herself is none other than an opera singer, ideally suited to represent the many facets of being a woman on the operatic stage. Moreover, the complexities of her character mean that the singer playing the role enjoys a great deal of latitude in choosing how to portray her. It is no wonder, then, that singers often call Tosca a favorite role—not only because of the lushness and beauty of Puccini’s music, but also for the sense of identification they feel with the character, both as an artist and as a woman. Tosca is, ultimately, rich with possibility: she is flawed, vulnerable, heroic, strong, ambiguous, impetuous, defiant, talented, reviled, and admired. In short, she is human. Boston Lyric Opera's Tosca runs OCT 13 - 22, 2017. Images (top to bottom): Costume rendering for BLO by Deborah Newhall; Tosca poster, 1899, by Adolfo Hohenstein.